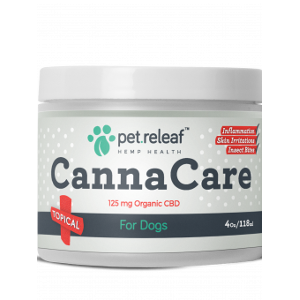 Pet Releaf CBD-infused Canna Care Topical for Dogs is a 100% plant-based, vegan product. It contains our certified USDA organic full spectrum CBD hemp oil and was developed to offer pets an all-natural skin application to help with external irritations. Virgin Ucuuba Butter, Virgin Andiroba Oil, Grapeseed Oil, Lemon Peel Oil, Blue Mallee Eucalyptus Oil, Nerolidol, Wintergreen Oil, Organic Calendula Flower Extract, Organic Rosemary Leaf Extract, Certified USDA Organic CBD Hemp Oil and Copaiba Oil.